Please pray for these to grab people’s attention. This week Graystone is sending out 36,000 mailers to the homes closest to our church. 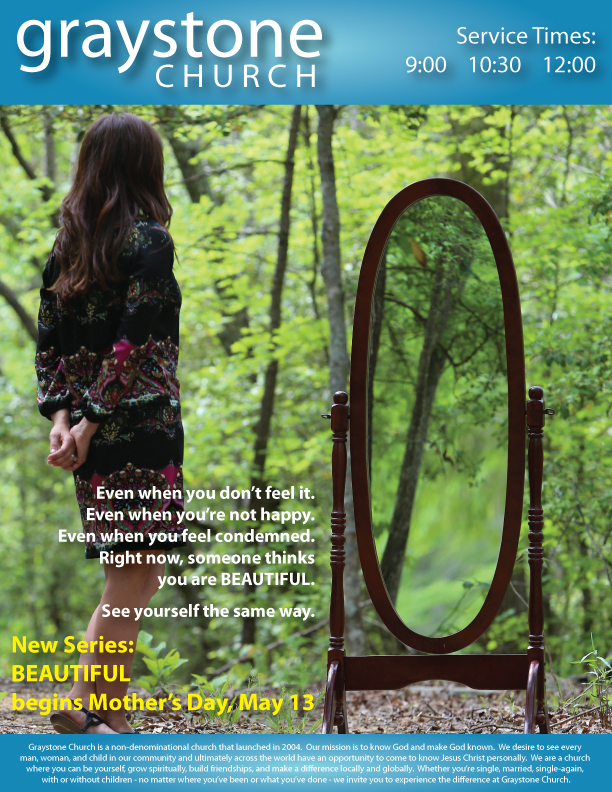 We are inviting our community to a brand new message series, Beautiful, beginning on Mother’s Day, May 13. Please pray that the mailer would grab people’s attention, and God would use them to bring hundreds of people to Himself. I will share more on the new series and our special Mother’s Day plans in a future post. But let me just go ahead and say, you definitely want to bring mom and all the females in your life to Graystone on Mother’s Day. They will absolutely love our new series, Beautiful. Just wanted to say Jonathon that I look forward to the Series starting Mother’s Day. I have enjoyed all the series so far this year and I look forward each Sunday what I am going to learn. The whole team on Sunday is great and it’s obvious how much preparation goes into each service. I am Blessed to be apart of Graystone! !